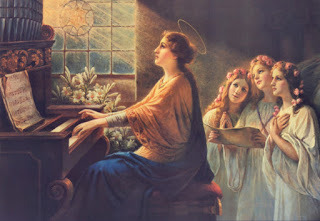 Comfortably Catholic: Happy St. Cecilia Day! Today is the feast of St. Cecilia, the patron saint of liturgical music. 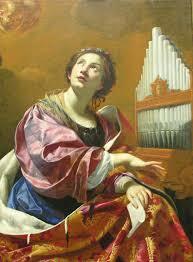 Although she is often depicted playing an organ or lute, the story of her 2nd Century life only mentions music that Cecilia sang "in her heart" to the Lord. Cecilia was a Roman noblewoman forced to marry a nobleman, Valerian. Before they could consummate their marriage, Cecilia told Valerian she had pledged to remain a virgin and an angel protected her. Inspired by her faith, Valerian and his brother were baptized and devoted their lives to burying the early Christian martyrs. For her part, Cecilia preached, converting hundreds. She became a target for the local prefect who ordered her killed by suffocation in the baths. Despite being locked into the baths for a day and a half in intense heat, Cecilia didn't break a sweat. (No, really, she didn't sweat.) The prefect then sent an assassin who attempted to behead Cecilia, striking her three times with a sword. She did not die. For three days she bled, still preaching to those who would hear her, until she succumbed to her injuries. 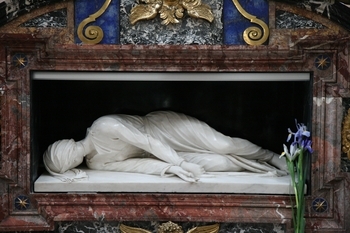 Over 1,000 years later, her body was exhumed and found to be incorruptible (intact and not decayed). She wore a veil over her head and appeared to be asleep. On this day, liturgical musicians the world over have concerts in her honor. While she is mostly remembered as the patron saint of music, her story is typical of the story of many women in the early Church. Her faith was unchanging and her convictions as a virgin were unshakable. She preached and converted those around her. She chose to die for her love for Jesus. She was the very first incorruptible saint. I hope you are as inspired as I am by this great woman of faith.